Yes, now y'all know, 81police doesn't usually hunt with an 8 or 81, do y'all think less of me now? Shot this buck with a 6.5 Grendel @ 180 yards, opening weekend here in Texas. For all our members out there that hunt, please feel free to post your 2013 hunting successes here! Cam, You are soooooo lucky my friend! 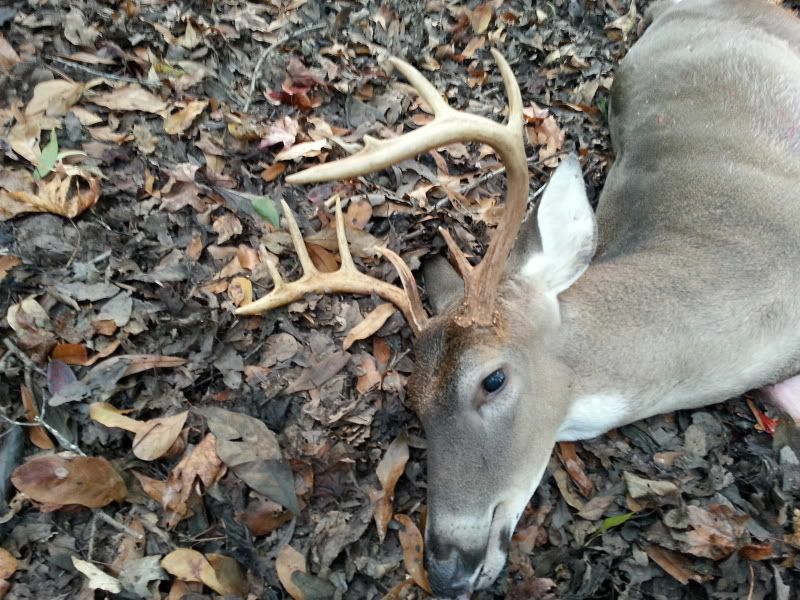 That is the biggest buck that any member has posted on the site, that I can recall. That buck is a BIG BRUTE by anyone's standards. He has great mass and he is wide. The tine length is very impressive as well. The muscles in his neck are swelled and this guy looks angry! Thanks for sharing the pictures and I appreciate the email about the hunt this morning. Again, you are one lucky hunter my friend! I razzed you a bit in my email & I'd like to light you up for not using one of your 8's or 81's on this incredible buck, but I just can not do it Cam. Your buck is incredible and it would be a lifetime trophy for anyone. You have set the bar very high for posting any 2013 hunting pictures sir. I think everyone may feel somewhat reluctant to post a picture of a smaller buck, but we all love to see the hunting pictures and we all enjoy the stories that these special times provide. We'll be posting some pictures here, with or without any deer. It's all about the special times shared afield with family and friends. Congratulations on a very beautiful buck Cam! P.S. Cam did say he hunted with a Model 8 as well this season. I hunt with a rifle that was my Dad's as well. It's a Weatherby Mark V in .270 WBY Mag. I'm guilty of hunting without an autoloader too, from time to time. 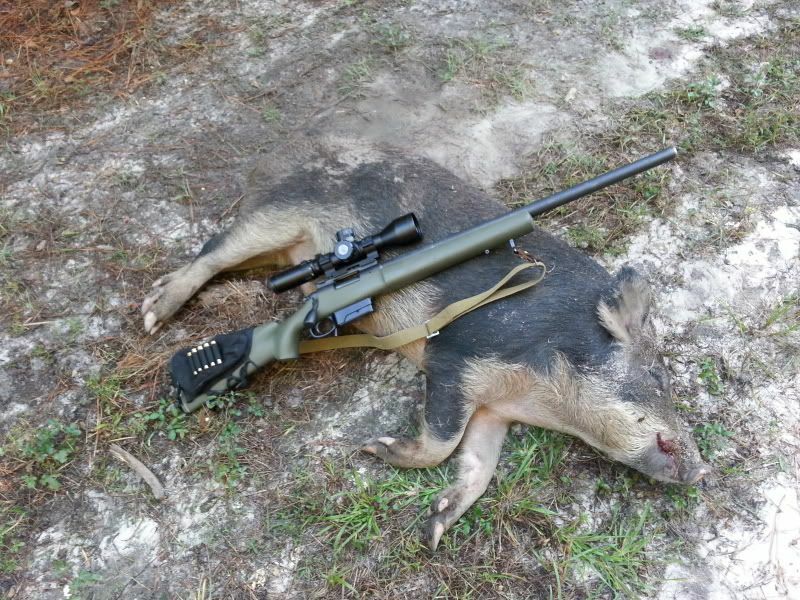 Certain conditions and terrain, call for the right rifle and it's quite obvious that the 6.5 Grendel was the right choice for this hunt. Thanks for sharing the picture sir. Again, it is a very beautiful buck & one to be very proud of in my book! Last edited by S and S HUNTCLUB on Wed Nov 06, 2013 7:33 pm, edited 1 time in total. That is really a nice buck. That is a good distance too. I have always preferred the long shots as you well know. Is there any chance of seeing your Dad's bobcat? That's a very nice buck. Congrats on a job well done there in Texas. By the way, I made a post on this thread last night which didn't post at all. I basically said the same thing. This has happened before but I just didn't say anything. It's probably just me or my machine. Anyways, you can sure be proud of that buck. Thank you all for the kind words, I'm very fortunate to have gotten this buck. S and S HUNTCLUB, remember this is a hunting "victory" or "successes" thread, and in my book time with family is the real reward! I can't wait to see the S&S camp 2013! Hope your dad is able to make it out! Hey jack1653, here's dad's two bobcats. 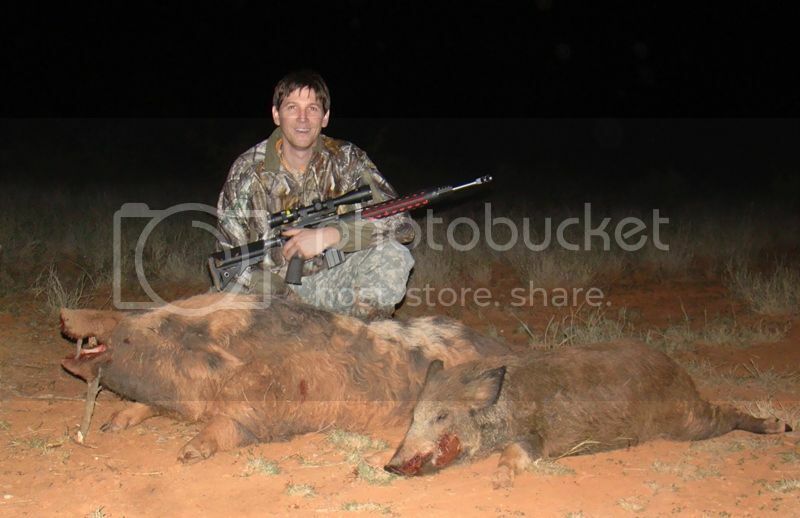 He was hog hunting and ended up shooting these two toms in one weekend. He saw 6 bobcats that trip!! He's hunting with a Rem. 700 in 257 WBY Mag. Talk about a couple trophies! Thanks for posting Kenny's bobcats. They are a couple of large cats and surely would make a couple of beautiful mounts. Is he going to mount them? I was also wondering if he was shooting the custom ammunition that I gave him. That was the same ammunition that I used on the big hog that I shot when I hunting with you a couple years ago. If he should need some more, let me know and I will have Tom load some for him. If I recall, I left the load specs with Kenny. It really doesn't matter because Tom keeps a record on all special orders. Good start to the season, the 257 Roberts. dropped this forkhorn in his tracks this morning, 40 yard shot. KAR 88 sporter made in 1894. 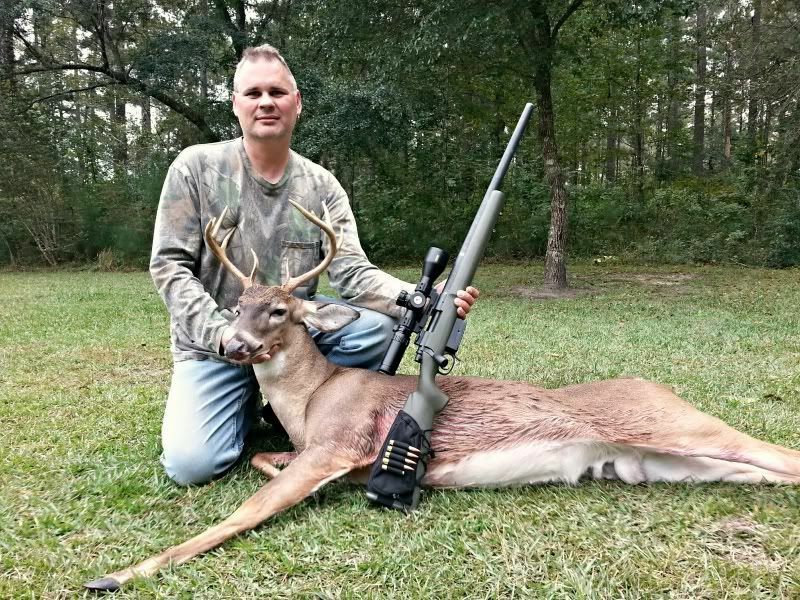 I've been out a few times this fall and in September I hunted with a group of other disabled veterans in South Carolina and cleaned up with a nice 6 point buck, a mature doe & 3 hogs...all trophies. One was straight up Russian boar and another looked like it escaped farmer Brown's during the summer. 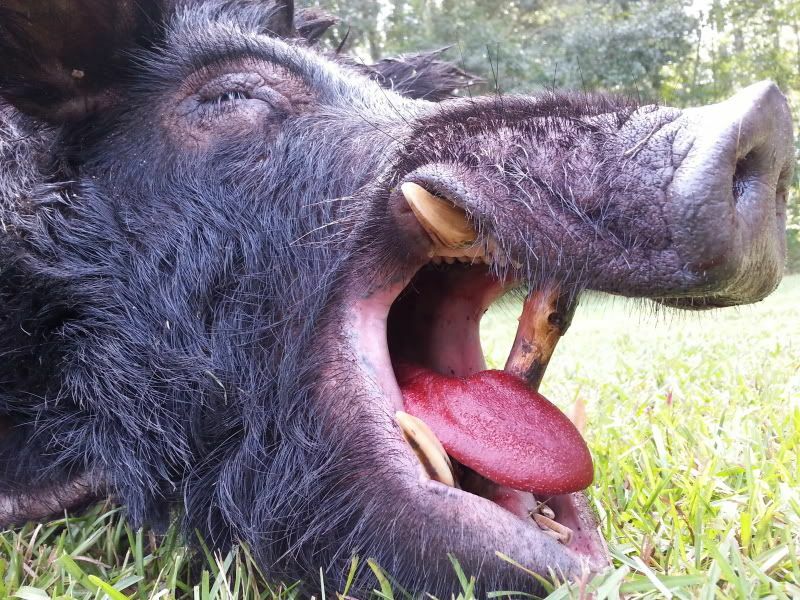 I shot both black hogs less than 30 minutes apart and the 2nd one was sniffing the first one that I shot so they were in a neat little pile. Now the first week of November I was invited back down to SC and took this nice 10 pointer the first morning out. 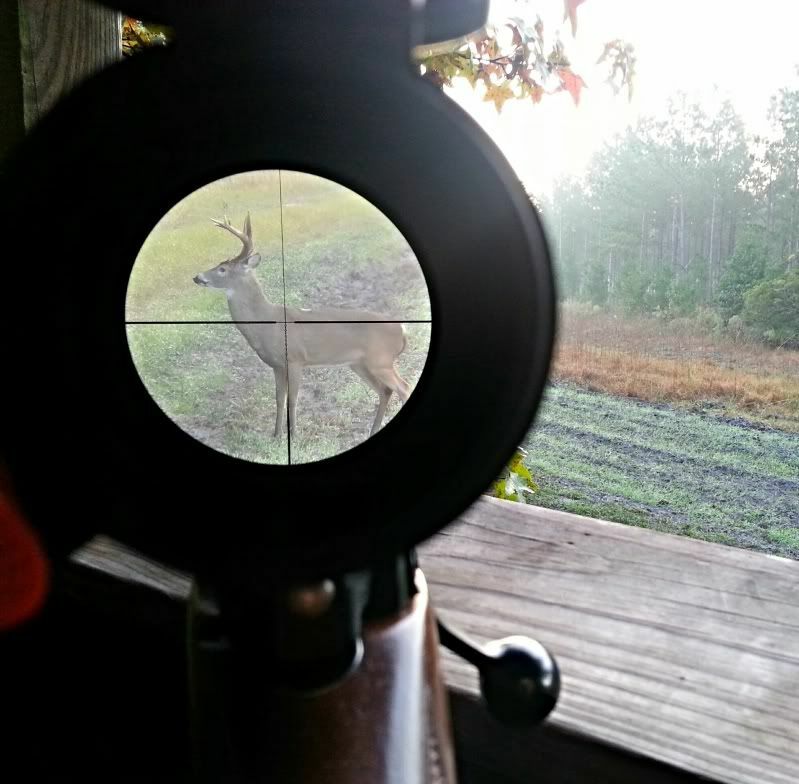 I was put up overlooking a 700yd cotton field and right after sun up I watched a number of smaller bucks mill around until I saw this fella come out just shy of 400 yards diagonal from me. He decided to stroll towards me, but when he got to 215 yards away he decided it was time to head back to where he came from and that's when I took the shot. 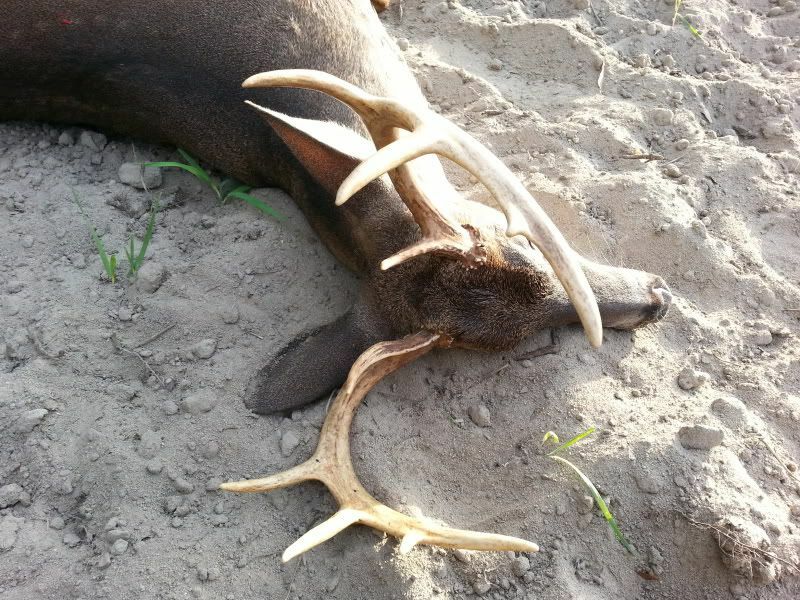 He ran at least 120 yards back across the field and 20 yards back into the woods where I found him stone dead. 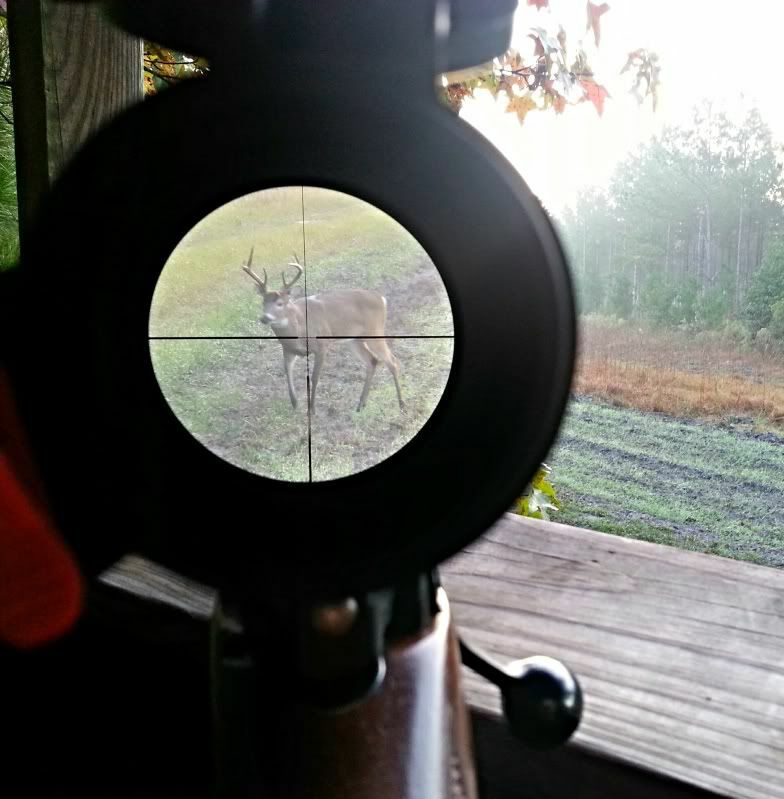 He is the biggest deer that I have ever shot and is pretty big for a Carolina deer. Up until this point I shot everything with a rifle that I built with my own 2 hands, a Remington 700 .308 short action that I assembled from a bare action. She's a proven killer that is laser accurate. Well after I got my 10 pointer I was out for does and pigs so instead of lugging around that heavy rifle, I toted my svelte CZ 527M Carbine .223 that is a scant 6.5 pounds and is lethal out to 200 yards for my intended game. This evening I was put up in a short ladder stand overlooking a narrow cut that has a small food plot and a feeder 106 yards directly in front of me. I wasn't up there not even an hour when I saw what looked like 8 pigs stuck together moving inside of a dust cloud. They were all perfect eating size, anywhere from 50-100 pound size and not in any hurry. They made their way to the feeder but because they were all stacked up on each other I couldn't take a shot because I would've gotten at least 1 more with a pass through that would've been more than likely a wounding shot. I ended up watching them for a few more minutes through the scope and when I got one that finally separated I took a quick shot. Once the dust settled from the chaos I had this nice little white & black porker making his last few kicks before going to piggie heaven. 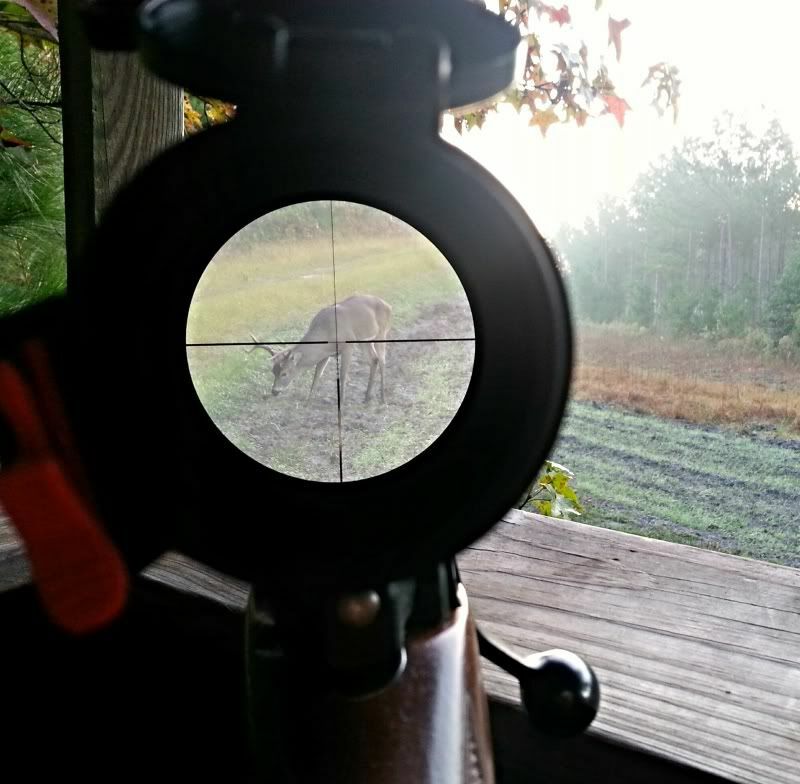 The following morning that I shot porkie, I once again took my CZ with me hoping to put a nice doe in my freezer. It wasn't a few minutes past 8am when this beautiful 8 pointer came out just over 200 yards out and slowly made his way to within 45 yards right in front of me! I know that I could've put his lights out and as much as I wanted to shoot this guy, I didn't want to chance wounding and losing him because of emotion and not reason. He had a beautiful rack that was perfectly symmetrical and nice and tall. 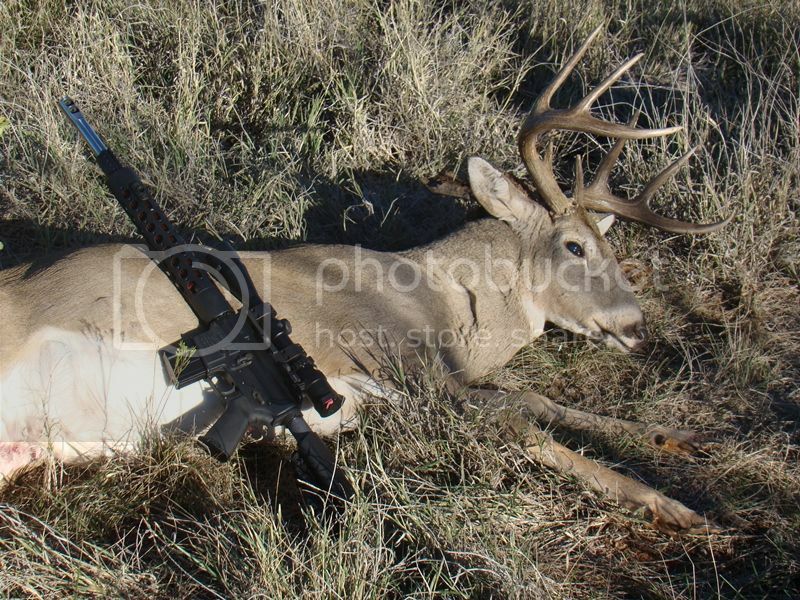 I'm going back down right after Thanksgiving, so maybe I'll see him again when I have my .308 with me. cam i would have ran over that deer with my truck if i had to! that's a nice buck. Here's an additional picture of my 8 point and a few hogs from October. 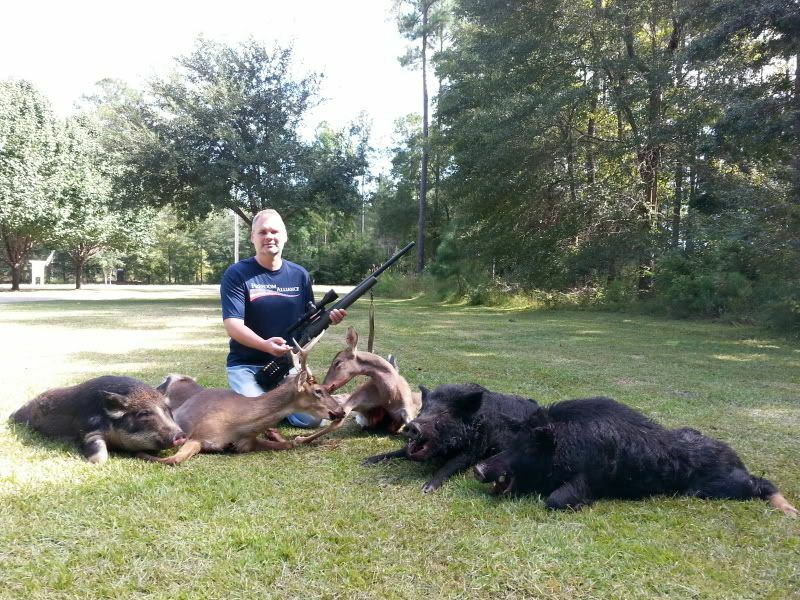 The first two are a pair of 130lb and 180lb boars. 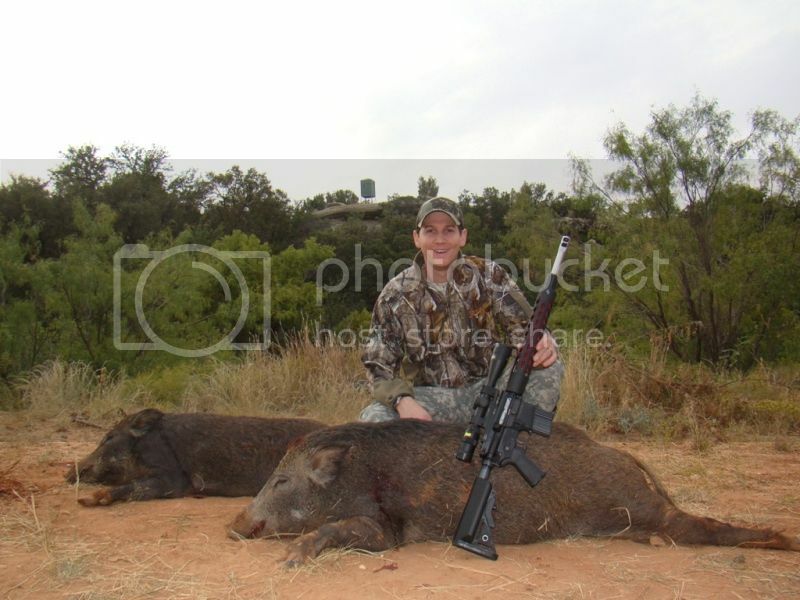 The last two is a 150lb sow and the largest hog I've ever killed, a 270lb boar. All were taken with the always impressive, 6.5 Grendel. 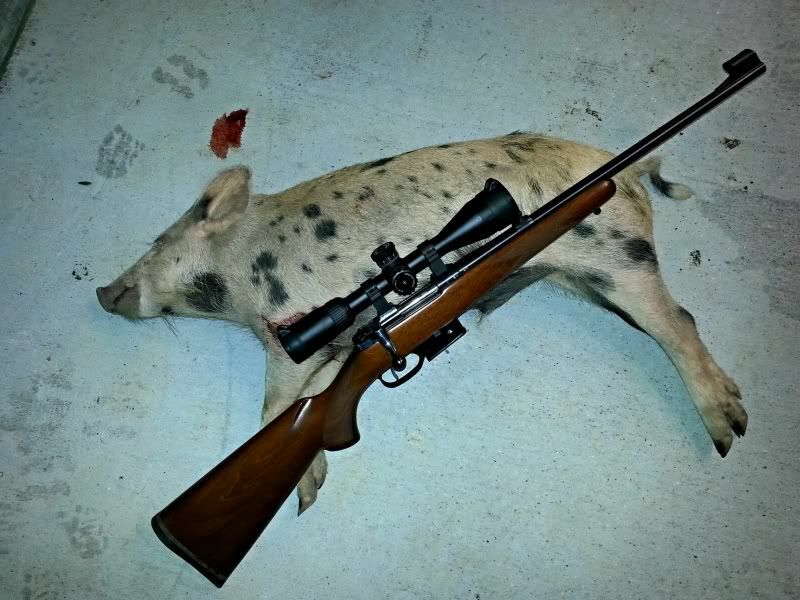 I really support the hog hunting. They are Not what anyone would call natural wildlife. Just be sure to carry a BIG 45 or 44 for emergencies. Please be careful. Boars like that can have YOU for lunch. Deer camp 2013 was a success! As it is every year, the food was great, the new Outfitter's tent was really comfortable and the firearms were a blast to shoot too! The weather was pretty bad for deer hunting in northern Michigan. The temps were in the mid 40's to mid 50's during the day, with 45 - 50 mph winds and very heavy rain at times during the trip. There was one time, within a period of five minutes, that we had so much heavy rain, that there was 3/4" of standing water on the flat sandy ground where our cook tent and guide tent were. I have never seen the sky's open up like that before! I saw 24 deer opening day. I had a Doe permit and let 23 Does pass by on opening day, as I did not want to have one hanging in the warm temps that were expected. The 14 Does I saw in the morning were all within 60 yards and I had everyone of them in my sights with my #51 FN 1900. I had a nice buck in my sights on opening night, but I did not have the time to pull the trigger and he was gone! Yeah I know, its like the big fish story about the one that got away. Bottom line is, the trip was incredible & spending the time with my Dad, my brothers, my three nephews and my oldest brothers new son-in-law, whom recently came home from Afghanistan, was all well worth the trip and it was very enjoyable for all of us. Somehow over the years, I took on the task of being the camp cook for everyone. Breakfast, lunch & dinner! Getting up @ 5:00 a.m. and cooking breakfast for everyone, then off to the woods, back at lunch and off to the woods again for the afternoon's hunt and then, back to camp to prepare the evening's meal, and then playing cards until 1:30-2:00 a.m., I do not get much sleep during the trips. But, I sure do have a real good time! Here's a few pictures of the food, the new guide tent and the new 1931 Model 8 POE! Deer Camp 2013 was a beautiful SUCCESS !!! + 1 "Enjoy Life". Great photos and yep that`s a deer camp. Imfuncity will now have a visual when we mention "camp". I feel your pain with the cooking duties. I made the mistake of commenting how much I enjoyed cooking on my first trip to Colorado. Forgot that advice to be careful what you volunteer for. The getting up and doing breakfast was ok cause I`m usually up before everyone else so why not. Midday meal usually sandwiches and soup,but the evening meal was a killer.Tired from the days hunt I didn`t enjoy it one bit. The savior was the purchase of a big Dutch oven. If the ground allows it just dig a hole big enough to bury it. Fill bottom with hot coals or charcoal bricks, shovel more coals on top and cover it up with the soil from the hole digging. While you are hunting,your roast,chicken or ham and all the veggies are cooking away. When the hunt over you have the meal already prepared and ready. Dutch oven ...would not leave home without it. Would `ve been a little difficult this year with your deluge but keep it in mind for next season.Thanks for the great photos. Next year I can probably get a Browning 1919 belt-fed up there for you to use. It will give you more bullets than the POE rifle. S and S HUNTCLUB, what a fun family trip! Those thick woods of Michigan sure are a far cry from the terrain we have down here in Texas. Despite the poor weather, seeing 24 deer is quite action packed! I'll bet the new son-in-law was thinking, "I married into a fun family!". Memories with family, that's #1! Thanks for sharing. Btw, that POE looks pretty mean! Hello again & thanks for the kind comments guys! Joe, In regards to the Dutch Oven... I will certainly take your advise. We used them for many years in Boy Scouts, for many different meals. My favorite was the "Peach Cobbler"! Jim and Cam, You both know the history on the Model 8 POE and how everything came together on that deal. Both of you guys were a tremendous help, in regards to making it all come together for me. I promised Cam awhile back, that I would post the story behind the POE as soon as it all came together. I will tell the "complete story" soon and post a few pictures of the rifle, in the Pictures of Model 8's & 81's forum section. Here's a few more pictures. My Dad was able to make it to Deer Camp for another season & that was a real blessing. It was Eric's first time ever deer hunting & his first time ever at camp. He really enjoyed the hunts and said it sure beat being shot at. Eric (with the beard) is the new addition to our family and it was great having him there with all of us. He's one of the young men that help keep this nation free and we're very thankful for all of our veterans service! The other young guys are my nephews and Jeff's two sons. It was a great time for everyone. I am still wanting to head north and spend some more time again at deer camp this year. 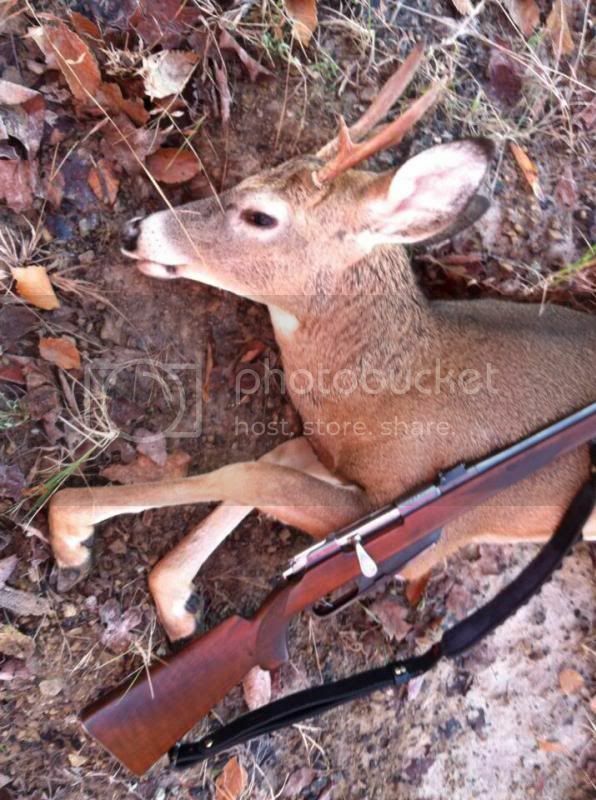 The muzzle loading season started yesterday December 6th and runs through the 22nd. I am trying to make that trip come together. There is plenty of snow on the ground now with the colder temps and it'll make the hunting much more exciting. Sure beats the rain! Looks like another successful season was had by all.